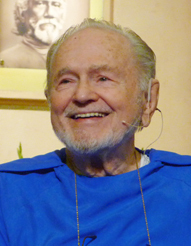 Swami Kriyananda (J. Donald Walters) has been a tireless proponent of Yoga principles for 60 years. In 1948 at the age of twenty-two, he became a disciple of the Indian yoga master, Paramhansa Yogananda. He is one of a few remaining direct disciples of Yogananda teaching today. At Yogananda’s request, Swami Kriyananda devoted his life to teaching and writing, helping others to experience the joy and living presence of God within. He personally lectured on four continents in seven languages over the course of more than 60 years. His television programs, audio and video recordings of his talks and music, and his many books in 28 languages have touched the lives of millions of people. Swami Kriyananda has taken the ancient teachings of Raja Yoga and made them practical and useful for people in every walk of life. His books and teachings cover nearly every field of human endeavor, including spiritualizing business life, leadership, education, the arts, community life, and science. He has written extensive commentaries on the Bible and the Bhagavad Gita. Swami Kriyananda is also known as the “father of the intentional communities movement” which began in the United States in the late 1960s. Inspired by his guru’s dream of establishing spiritual communities, in 1968 he founded the first of what are now nine Ananda communities worldwide. They provide a supportive environment of “simple living and high thinking” where 1,000 full-time residents live, work, and worship together. “The time has come for people to live lives of even higher dedication than that which inspired monks and nuns of the past…The time has come for people to direct their spiritual awareness also downward into matter…to everything they do: their work, to education, to family life, to friendship, to their communications with strangers, to the way they build their homes — to all the most mundane, practical aspects of daily, human life. A monastic nearly all of his adult life, Swami Kriyananda is a swami of the Giri (Mountain) branch of the Swami Order, as was his guru and his guru’s guru, Swami Sri Yukteswar. He was the Dharmacharya (leading according to Dharma) and spiritual guide for Ananda communities and activities worldwide. He founded The Nayaswami Order, a new monastic order, in 2009. His successor is Nayaswami Jyotish. 2009: The Nayaswami Order: A new movement based on positive aspects of renunciation, rather than the traditional world-negating approach. It is intended for people from all walks of life, married or single, who are committed to finding God. The Nayaswami Order is open to people of every religious affiliation. Currently, there are close to 1,000 members of this order, described in A Renunciate Order for the New Age. 2009-present: An Ananda community and retreat center near Pune, India. 2003-present: An Ananda center in India headquartered near New Delhi. Initiatives include: training thousands of Indians in meditation and yoga principles, Kriya initiations and new meditation groups in major cities, the Yoga Institute of Living Wisdom, development of affordable solar power technologies for India’s small villages, and a publishing company to bring the teachings of Yogananda affordably to India’s people. 1967-present: Nine intentional communities worldwide with 1,000 residents: Ananda Village in Nevada City, CA (the first and largest community); Ananda Seattle; Ananda Portland, OR; Ananda Sacramento; Ananda Palo Alto; Ananda Los Angeles; Ananda Europa in Assisi, Italy; Ananda in New Delhi (Gurgaon), and Ananda in Pune, India. 1967 to present: Places of worship called Ananda Sangha in each of the cities above, providing training in Raja Yoga and meditation, spiritual support, and weekly worship services. 1967 to present: Retreat centers that provide spiritual training for guests and opportunities for seclusion. Expanding Light Retreat in Nevada City, CA; Ananda Meditation Retreat in Nevada City; and Ananda Europa in Assisi, Italy. 1973 to present: Education for Life Schools for children, which offer character development, strong academics, and development of moral strength. The school curriculum is ecumenical; students of all religious backgrounds may attend. 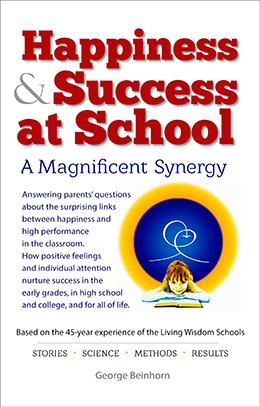 There are schools in Portland, Seattle, Palo Alto, Nevada City, Assisi, Italy, and in India. Many other schools are adopting the curriculum and ideals of Education for Life. 1987: A new religious order (Ananda Sevaka) and The Rule, which guides the spiritual lives of order members. This order is unusual in that it provides guidance both to monastics and householders. 1986: A new worship service called The Festival of Light, which describes the soul’s long journey from relative ignorance to the light of spiritual understanding. This ceremony is an integral part of Ananda’s Sunday worship service, accompanied by music and periods of prayer and blessing. 1971 to present: Meditation groups, which meet regularly for meditation and fellowship. There are currently over 125 groups in 19 countries. 2013-14: Collaborated on the writing and early filming of The Answer, about his search for spiritual truth and his early life with Yogananda (premiered at Cannes Film Festival in 2015). 2012-13: Collaborated on the writing and filming of Finding Happiness, a film starring Elisabeth Rohm (LA Law) which explores the lifestyle and approach of people living at Ananda communities. 2012: Author Yogananda for the World, an exploration of how Yogananda is represented by Self-Realization Fellowship in ways that diverge from his original teachings and personal experience of the great yoga master. (a more complete list of books is below, under “Author”). 2007: Author In Divine Friendship: Letters of Counsel and Reflection, a compendium of letters sent to seekers over a 40-year period. 2007: Author of Revelations of Christ, Proclaimed by Paramhansa Yogananda. Based on the experience of realized saints, and in many cases, different than the traditional interpretations by theologians. 2006: Author of 600-page commentary The Essence of the Bhagavad Gita, scripture to a billion of the world’s people. New insights on the nature of consciousness, the yogic pathway to freedom through subtle energy currents in the spine, and the importance of the mystic and the moral teachings of the Gita. 2003-2004: Authored a weekly column on spiritual living for The Hindustani Times. 2005: Keynote speaker, International Project Management Association (IPMA) Conference, New Delhi, November 13-16. 2005: Recorded for AASTA Television Channel 365 episodes of a 20-minute program called “Way of Awakening” based on his book, Conversations with Yogananda. Continues to be broadcast daily to hundreds of millions of Hindu viewers worldwide. 2005: Guest of honor and keynote speaker for launch of Conversations with Yogananda, Milan, Italy. 2005: Wrote Material Success Through Yoga Principles, an ongoing home study course to help integrate spiritual principles with work life. 2004: Began teaching and writing full-time in India, and guiding the teaching activities of a large team of long-time students near New Delhi. 1998-2004: Began teaching and writing full-time in Italy, teaching weekly at the Ananda Assisi Retreat, one of the largest yoga retreat centers in Europe. 1991: Speaker at “Visions of the Future” conferences with Louise Hay and others. 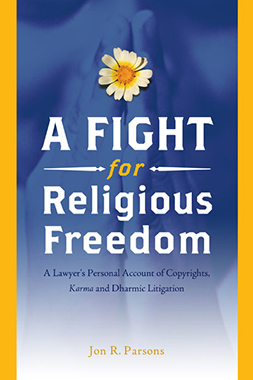 1990-2002: Expert witness and defense in a major lawsuit which threatened religious freedoms for Ananda, and potentially many other small religious group in the U.S. Ananda won this case and established helpful precedent in future cases: the teachings and likeness of Yogananda are not the property of any single organization, and many of his original writings are now in the public domain, and can be studied freely by anyone. Yogananda’s name and the phrase “Self-realization” cannot be trademarked or owned by any organization. 1989: Keynote speaker for Whole Life Expo in San Francisco, Los Angeles, and New York. 1986: Wrote Education for Life, describing the educational approach used in Ananda schools for children. 1980: Established a retreat and community in Italy. 1978: Began the first of eight spiritual communities in more urban areas, this one in Sacramento, allowing more people to live and work in an Ananda community, and still be active in the world. 1976: Wrote The Path, an autobiography that also serves as a guidebook for other aspiring disciples: how to seek God, how to develop spiritually, the nature of a guru. 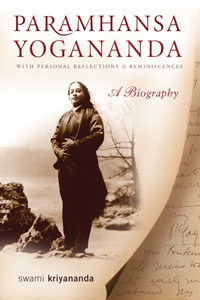 He also shared many examples from Yogananda’s life that had never been published before. 1973: Founded Education for Life Schools for children, offering character development, strong academics, and development of moral strength. The school curriculum is ecumenical; students of all religious backgrounds may attend. 1967-2013: Author of many books that help people to spiritualize nearly every aspect of human endeavor. 1967-2013: Teaches the public and his long-time students in weekly Services, retreats, classes, and satsangs. He has taught thousands of classes since 1949, and continues to the present day. 1967-98: Taught yoga and meditation throughout northern California. 1969: Founded Ananda Community in Nevada City, CA as an experiment in intentional living and as a supportive environment for individuals seeking spiritual growth. 1968: Wrote Raja Yoga study course as a comprehensive home study guide to its practice and understanding. 1967: Founded the Ananda Meditation Retreat in Nevada City, CA for the study of yoga and meditation, and the teachings of Paramhansa Yogananda. 1966-1969: Had a weekly 15-minute radio program in Sacramento. 1966: Taught for the Peace Corps at University of California at Davis. 1964-1969: Had a weekly 15-minute radio program in San Francisco. 1958-62: Served as the main minister and lecturer in India for Self-Realization Fellowship (SRF) and Yogoda Satsanga (YSS). 1960: Elected to the Board and made Vice President of SRF/YSS. 1950-1958: Served as the main minister for Self-Realization Fellowship churches in Southern California. 1950: Placed in charge of the male monastics by Yogananda. 1949: Made a minister by Yogananda. Instructed to do so by his guru, began lecturing regularly at the SRF Hollywood Temple in Los Angeles, CA. 1949-2013: Swami Kriyananda did not have what most people would consider a personal life. He endeavored to uplift humankind however possible, through writing, lecturing, music, and acts of loving-kindness. He trained a large number of his students to teach and to assume leadership responsibility in the same way, as free as possible from personal concern, thinking of the spiritual needs of others. He offered spiritual counseling personally and in correspondence. He was a patient and sensitive teacher, allowing people to learn by experience, and putting the needs of individuals above the organization. “People are more important than things” is one of the guiding principles of Ananda life; leaving things undone is preferable when there is spiritual benefit to someone in the middle of learning a hard life lesson. “Where there is adherence to dharma, there is victory” is another of Ananda’s guiding principles. Kriyananda encouraged his students to live in harmony with others, but also to speak out with courage when true principles are at stake. His life was filled with many examples of both kindness and firm courage in the face of adharma (injustice). Swami Kriyananda has written many books, each intended to help individuals expand their awareness and deepen their inner experience of God. They are inspired by his more than 60 years of discipleship, his intense study and personal experience of the power of Raja Yoga to transform human consciousness, and his compassion for the suffering of the soul when separated from God. Eighty-one of his books have been translated into one or more languages, other than the original English. His books are available in 30 different languages in 90 countries. Applied the principles of Yoga philosophy to the pressing needs of daily life, and devoted his lectures and books to making those principles accessible and practical for all. Developed a method of educating children that teaches skills in maturity and character to prepare children for success in life. 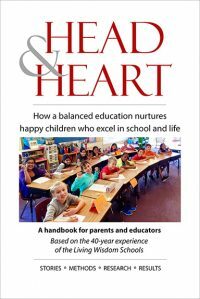 Children learn emotional self-mastery, conflict resolution, and compassion, among many other skills. Emphasis is on increasing awareness of Self and of others, and developing a lifelong enthusiasm for learning. Developing a curriculum for a new school in India for children with practical tests that will measure these critical indicators for success later in life: Creativity Quotient, Ambition Quotient, Happiness Quotient, Competency Quotient, and Perceptivity Quotient (rather than only an Intelligence or IQ test). Taught his long-time students by suggesting life and work situations that bring out the character and soul development needed. His instructional style was unusually understated and patient, allowing people to learn for themselves by experience, sometimes hard-won over many years. Lyricist and Poet: Won two poetry awards at Haverford College; studied under W.H. Auden. Playwright: The Peace Treaty, The Singer and the Nightingale, and Jewel in the Lotus. Photographer: Fifteen-thousand photographs which endeavor to capture the consciousness behind images. Some photos have been used on inspirational posters and in books. “Occasional artist with a brush” – paintings have been used on book covers and on posters. Vocal soloist on recordings including: I’ve Passed My Life as a Stranger, Some of My Favorites, Soul Songs, Memories, Mantra, and Cosí Canta il mio Cuore. 1948-2013: Swami Kriyananda has worked full-time in service to others for little or no income. Copyrights to his books and music have been placed in a trust. Royalties are directed toward the work of sharing Yogananda’s teachings with the public. For many years, he received no salary or stipend, and depended on donations for all his needs, including food, housing, and medical care. 1997: After the massive earthquakes that damaged large areas around Assisi, Italy including the Basilica of St. Francis, Swami Kriyananda raised funds to help rebuild homes in the area in a campaign called “Hope and Homes for Italy.” He encouraged the use of wood instead of stone building materials, to minimize future earthquake fatalities. 1948: Began a lifetime of discipleship to Paramhansa Yogananda, which proved to be the “higher” education he was longing for.